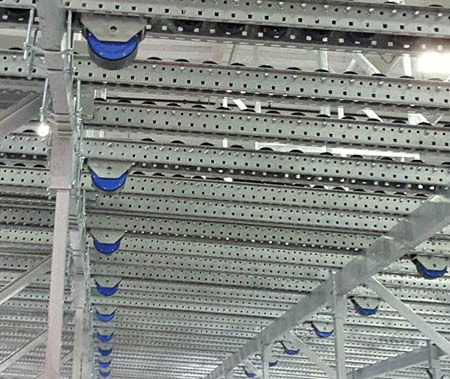 Harnessing the power and simplicity of gravity makes pallet flow racking a unique material handling solution. But… working with gravity AND heavy pallet forces within pallet flow rack requires expert design and engineering for safe, effective operation. To that end, we’d like to reintroduce our expanded line of pallet flow speed controllers. Mallard’s extensive variety of custom speed controllers ensure consistent pallet flow/conveyance at the most efficient and safe speeds for your specific application. Mallard is the only manufacturer who offers a variety of speed controller capacities, uniquely designed for your product weight ranges. We’ve added a new, more comprehensive category summary page, individual product pages, illustrations, and photos to our website to help our dealers and customers better understand the differences between the speed controller products and to help them select the right controller, or combination of controllers, for their pallet flow racking application. What is a speed controller? Speed controllers provide a necessary control mechanism for advancing pallets in a flow lane. Acting as a sort of braking device, the speed controller slows the pallet as it gains speed in a normal gravity inspired process. Slowing the pallet provides additional benefit of better lane tracking and, of course, safer product and worker conditions. All Mallard speed controllers are available in light, medium and heavy-duty options to best meet your pallet flow needs. Drop-In speed controllers are an “install your own” option that offer needed pallet flow control and/or replacement of existing mechanisms. They are compatible with all wheeled tracks and narrow roller track applications and are also available in a double-wide design. Direct Mount speed controllers are top-mounted in the pallet flow lane for immediate contact with the pallet load. They are designed to be compatible with most wheel and roller track types. Indirect Mount speed controllers are mounted underneath a full roller pallet flow lane in a position where the roller is directly in contact with the speed controller and not the pallet. ABMA Bridge speed controllers are a type of drop-in speed controller used in retrofit applications. They bolt into existing pallet flow rails and are easily field installed. They are compatible with Magnum, IE and skate wheel. In addition to more detailed product pages and updated resources, we also have several videos that show speed controllers in action, and how-to videos with steps to install our drop-in speed controllers. We hope this information becomes a valuable resource to you and as always, we’d love to hear your feedback. 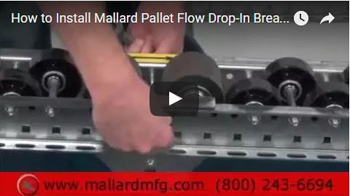 Call or email us to work directly with a gravity flow expert on your next pallet flow project.